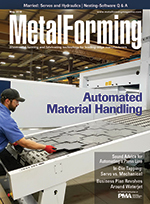 To meet rising demand for fabricated-metal products, Fab Metals purchased a 6-kW fiber laser in 2017, and three months later brought in another, an 8-kW model. RPM Design's plan to forego conventional processes pays off. As fabricators look for more from their nesting software, providers are delivering, says this industry expert. The technology has evolved, and here's what stampers need to consider when deciding which type of in-die tapping unit best fits the job at hand. The possible payoff: a safer, more productive pressroom and surprising ROI. When It Comes to GMAW, Why Ask Why? Forming Speeds: Why Ask Why?